Windows is said to be the most used Operating system. The user-friendly interface, compatibility with almost every software and enhancements over time has made it the operating system of choice for people. Moreover, they want to check out new features such as Simpler Task Manager, new Windows Explorer, Fast Startup Mode, Re-engineered Boot Experience and more. Some of the changes also disappointed Windows users. One of the change is No Start Menu instead of it, Microsoft has introduced new Start screen. This left many users confused and irate as they were not able to locate Start Menu on the go. Well, you don’t need to lose patience as now you have options. Getting a new Start menu is not that difficult at all on Windows 8. You can fabricate one for yourself with more or less the same functionality as Windows 7 Start menu. However, it is a time-consuming process and you might not like the end result. Fortunately, there are free applications that can do the job for you. Some possess different and interesting features, and others give you the homely feeling of Windows 7. We have listed some of the best free start menu replacements for Windows 8 users. Let’s take a look! It has a customizable start menu with multiple styles and skins. It gives you access to your recently, frequently used and pinned programs. It helps you to find programs, documents files, settings and more. 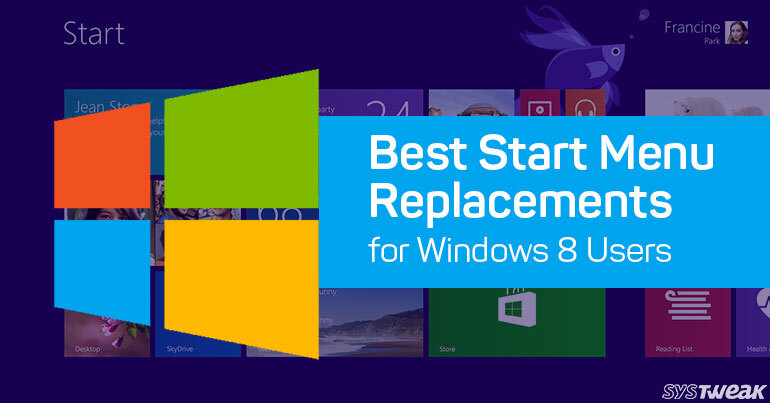 You can get Start button for Windows 7, Windows 8, Windows 8.1 and Windows 10. You can get Toolbar and status bar for Windows Explorer. It enables you to launch and pin programs faster than ever. It finds files faster than Windows 7. The interface of the app is very intuitive. It gives you plenty of options to change the look of Start Menu. You can also customize the look of Taskbar with the software. It enables you to get quick access to your programs. You can also pin your frequently used programs and apps with the software. You also get a MetroApps menu which provides you the access to Windows Store apps on your computer. It is highly customizable as you get multiple themes, style, fonts and more to get the look you want. The software allows you to turn your PC off right from the menu or launch a delay timer with ease. It enables you to access your programs in a simpler manner. It also allows you to improve the interface with new features. It doesn’t only have Start menu but also consists of a panel with common items such as Computer, Libraries, Devices, and Printers located at left side of the window. Another option is Control Panel view. Getting it on Start menu makes it easy to use the configuration and settings for the frequent users of them. The app gives you feel at home with the combination of start screen tiles and Start Menu. It consists of a bar of links and series of customisable tiles. You can get an easy and quick access to commonly used programs like Network, Search and run by a link bar. It also has an Apps button on the link bar which displays desktop applications when clicked. These are some of the best Start Menu replacements for Windows 8. Get your own Start Menu replacement app and customise your Windows 8 the way you want.